Parenting Gratitude Hack: What is 'The Three Things Project'? Last week was a crazy week. My husband has been away all month and although his work schedule always includes frequent travel, last week I struggled to cope. Tuesday of last week was particularly shameful. I lost my cool. I raised my voice and complained. Sadly, the children witnessed mummy at her worst. I was complaining about everything, from missing the tram to the taste of my morning coffee and guess what happened on Wednesday? I picked up my children from school and they both complained about their day. So much for my “do as I say and not as I do” parenting mantra. I felt embarrassed, I have many flaws but a lack of self-awareness is not one of them. I acknowledged that my behaviour was not up to scratch and the truth is I have no one else to blame for my children’s lack of gratitude but myself. But I am not one to stand defeat. Parenting is a tough gig, an important job that requires constant audits and reflection. The problem is external auditors cannot be trusted (other parents and strangers can be too critical) so with this job, you must self-assess. Your KPIs and strategic household management skills can only be assessed by you, the parent, which poses another problem – being too critical of one’s self. So instead of feeling disappointed for not being the best example for my children, I did what every diligent responsible adult would do – I ate chocolate…and came up with a plan. My plan was to wake up feeling grateful and hope the children would feel the same. On Wednesday of last week, the day my ‘plan’ was meant to take effect, we missed the tram by literally two seconds. I was so excited! Something going wrong was a perfect real-life example of how to be grateful, so I improvised, I told my children a story about Mr. Grateful and Mr. Complain. I told them about how Mr Complain always saw the worst side of life, how he missed the tram and groaned and looked at people angrily. Then, I told them about Mr. Grateful, who missed the tram but was so happy to be outside that he smiled at strangers, he appreciated the birds chirping and the trees swaying. Mr. Grateful knew that being late was not the end of the world and that he was lucky to live in a country where another tram would be there to pick him up from the next stop. My children recognised themselves (and me) in a series of stories I told them about Mr. Grateful and Mr. Complain and then I presented them with a ‘Mummy Project’ I called 'The Three Things Project'. I told them that when I picked them up that afternoon they had to tell me about three things that they were grateful for that day and that they would be graded by me based on their thoughtfulness and it worked! My son, who is almost five, told me about how his friend asked him if he was okay when he felt sad. He told me about how helpful his teachers were when he was making a Gruffalo and about he felt happy about what he had for lunch. My daughter, who is seven, said she enjoyed learning about sustainability and that an excursion to a plastic-free supermarket changed the way she perceived toys. She was grateful for her friends and the fact that she had warm clothes on a cold day. I was so proud! I gave them both an A+. They loved ‘The Three Things Project’ so much they continued to do it on their own. The next morning, we caught the tram on time and back by popular demand was another story about Mr. Grateful and Mr. Complain and although I tried to keep my voice down, my children were very excited about hearing about how Mr. Complain hated working on the farm. My son laughed so loud at the antics of Mr. Complain that a woman took off her headphones and looked at me. I was worried she was going to tell my son to be more respectful in German (we are working on our inside voices) but instead the woman, who had an American accent said: “Sorry, I overheard and I love that you're teaching them to be grateful, that made my morning.” Turns out not all strangers are critical auditors and I am so grateful for strangers who share kind thoughts (and grateful for those of you who read this blog, of course). Do you have too much self-confidence? Do you need something to bring you back down to earth? If you are searching for solutions for mild to severe ego growth, you may want to consider this tried and tested self-confidence reduction process…learning the German language as an adult! Yes, ladies and gentlemen, just when I thought I was so clever I began attending intensive German language classes. The classes taught me more than just the basics of German, they have shaped the way I see the world. Knowing other languages is really like having different personalities, it broadens your view of the world and allows you to think in different ways. On a personal note, it has reminded me of the fact l am an eternal learner with far more questions than answers. 1. The world is a lonely and confusing place when you can’t understand those around you: There is nothing more isolating than being in a public place and hearing people connect when you cannot. There have been tram announcements that we have missed, our tram changing paths and leading us into Germany because we had no idea there was a change to the route. For our family, this meant that we were often late to work or school but these incidents made me think about migrants (my own parents) and refugees. We are fortunate to know English, arguably the international language, for others life is way more difficult and discrimination often stems from ignorance and fear. 2. Swiss German and German are totally different: Learning High German in Switzerland is another obstacle because the Swiss have their own dialect. I was told that it is recommended one learns Swiss German only after they have mastered High German, so understanding locals at my beginner level is impossible. This means my language learning journey will be a long one. 3. Teachers are the best: I am biased because I am a teacher, but honestly my first German teacher Sara was amazing and I did not just learn German in her classes, she really taught me how to be a better teacher. There is no way I could’ve learned what I know now from Duolingo and podcasts alone, the connection you make with teachers and the encouragement they offer is invaluable. 5. There is a word for the day after tomorrow: A fun fact that I learned in German class is that there is a word for the day after tomorrow (which doesn’t exist in English) it’s “übermorgen”. I know I started this post flippantly but on a serious note, if you want to step out of your comfort zone and try something new I recommend learning a new language as an adult. Sure, your confidence might suffer for a bit but you will feel on top of the world when you string a few words together (that people actually understand). Annoyance number one : There’s no self-raising flour! Yep, searched high and low and thought I was typing things wrong into Google Translate as I was rummaging through the shelves of the supermarkets and pestering staff, until a British lady confirmed what I suspected was true. She saw my head shoved into a shelf of bags of flour at the Coop, cocked her head and raised her eyebrows before saying: “You’re not going to find self raising flour here. I have to get mine from the UK, they don’t have it”. I was shocked, a clairvoyant, I thought. Until I saw her staring at my phone screen which was on the shelf next to me. Now, you probably think this is a massive first world problem and it is, but venting still helps. Solution: I learnt how to use baking powder, two teaspoons baking powder for every spoon of flour. Yippee! If you follow me on Instagram (@gingerandbasel) you would’ve seen my jam drops. Super proud. Annoyance number two: I can’t access online banking or pay my phone bill on the company's app. It’s so weird how much it feels like 1999 here sometimes. When I asked about paying my phone bill online or using an app, locals stared at me blankly. Turns out it’s either direct debit or wait for it… going to the post office. Young people pay their bills like my grandma and the Swiss grandmas can out run me in a marathon (okay, anyone can out run me in a marathon). Solution: I had to pay my first bill at the post office, where I had to hand write things (throwback to Year 6) and then I set up direct debit (had to fill out a paper form, of course). Annoyance number three: I have no mum friends at my children’s school. Yep. I said it, making friends in your thirties is hard! The mums at the school are lovely but they have their cliques. On top of that my children started school at the end of the year which makes it difficult to properly connect with other mums. Sometimes I wish I was kid so I can be like, “hey nice fidget spinner, wanna hang?”. Alas, I am a big person, and I know in time friendships will develop organically. Special shout out to my high school friend Celine, an experienced expat who gave me advice about how these things take time. Solution: I talk to my BFF (aka my sister every day), friends from Sydney, do yoga and read! All this time alone has given me time to read, which is nice. Below is a list of books I have read or reread and recommend, especially if you’re into personal growth (the first two fall into that category). For all my busy friends, most of these are also available on audible. 1. Braving the Wilderness by Dr. Brene Brown. This book includes a series of anecdotes about belonging (very fitting for this post, I know). Dr. Brown is an expert in this field and her authentic voice makes it a great read. She doesn’t pretend to know all the answers, but makes you realise that there is power in vulnerability and that being authentic and kind should always be our primary goal. I love personal growth and am constantly reading books in this genre, many of them are patronising or too clinical. Brene hits the mark. She shares her academic research in a relatable way and although it took me three chapters to get into it, I am glad I kept reading. 2. Girl, Wash Your Face by Rachel Hollis. Unlike Dr. Brown, Hollis is not an expert in the field of personal growth but she’s fresh. She is a mum in her thirties who has four kids and built a media platform. Hollis’ book is now a New York Times bestseller and the book is split up into sections about the lies many women believe about their worth, family and work. She debunks each lie through personal anecdotes. This book was recommended to me by a friend and I really enjoyed the take away messages, something her therapist told her: “what other people think of you is none of your business” and "nobody will ever care about your dreams as much as you do". 3. Paris in Love by Eloise James. A friend of mine who is an author recommended this travel memoir. It is a series of vignettes about a family’s year in Paris. James’ posts are funny and uplifting and transport readers to Paris through vivid description. Although she is frustrated by the language barrier, the American author looks at her time away nostalgically and is grateful for how It transformed her family. Alone in a new city, but always together. 4. Confessions of a Domestic Failure by Bunmi Laditan. Author Laditon takes a humorous and often sarcastic approach to motherhood and pokes fun at the ‘Pinterest’ mums. As the title suggests, the debut novel is about drowning in motherhood but realising that everyone else is too. They just have better filters to cover it up. On that note, inspired by my reading list, this was my no filter, authentic post. Yes, Switzerland is beautiful but missing family can be lonely - but I'm not giving up, in the spirit of my mantra, I am working on it. I’ll get there. Slowly but surely. Until then, there’s chocolate, coffee and books. It was a Tuesday and I dropped the children off at school and thought ‘freeedooom and must have coffeeeee!’ But nothing was open. At 8.35am. Nothing. I could not find anywhere to have a coffee near their school (nothing like Stanmore school drop offs). I took a tram into the middle of the city and strolled for ten minutes. Still nothing. Eventually I found this cute little café that looked open but actually didn’t open until 9am. By that stage, that would've been a 15 minute wait for coffee. Way too long for someone who gets those awful coffee withdrawal headaches, so I decided to go back home and then, bam! Right there in front of Marktplatz tram stop I found a bakery! I rejoiced, my first date with Basel was saved, and the sweets looked a-may-zing! In my coffee deprived brain I even heard that ‘Halleluiah, Halleluiah!’ song when I saw the window display, and i'm sure a glistening ray of light shone on a croissant. Annoyingly, there wasn’t anywhere to sit outside, but I took that as a good sign, a sign that the coffee would be great. I walked/skipped in and asked to sit down but the woman at the counter couldn’t speak English. She looked right through me. I looked around and there was an empty table facing the counter, I shifted sideways to that seat, maintaining eye contact with the woman to ensure it was okay to sit there. I must have looked like Mr. Bean as I sat down staring at her silently because she looked puzzled. I sat there in silence for five minutes before a waiter walked out of the kitchen and looked startled when he saw me sitting at the table. “Grüezi,” he said politely but didn’t take my order, he just disappeared upstairs. I pulled out my notebook and tried to act ‘local’. Two Swiss men walked in to pay the woman at the counter. I watched on, envious at how swift and easy the transaction was. Finally, the woman took my order which was relatively painless, ‘a cappuccino and a croissant please’. She nodded, a win. Following this awkward alone date, I went to the Migros supermarket to get groceries because when you drop kids off at school it feels like you get ten minutes alone before having to pick them up (and when you pick them up they’re always hungry). I caught the tram to Claraplatz and asked three employees where I could find honey. Not one of them could speak English. I resorted to wiggling my index finger in a zig zag motion and began to buzz like a bee and repeated the word ‘ho-ney’ loudly. I soon had an audience of two staff members and one shopper staring at me as if we were playing charades. I continued to say the word ‘hon-eey’ as if the woman would understand if I buzzed or raised my voice. She looked beyond confused, possibly scared and kept her eyes on me as she called a colleague who could speak English. I was sent to level two, where I found honey and two security guards. That night, I called my mother to tell her about the coffee date, she told me I should have gone upstairs and blamed it on an air vent, nope, that's a lie and what my fictional mother Lorelai would say. My actual mother told me to toughen up and learn German. Date one. Awks. But I still like Basel. Sitting in a bustling Sydney café by the ocean, I sigh. My sister glances up at me. “Don’t worry,” she says smiling soothingly. “See the move as a new baby. You’ve had two and you know it takes at least six months to get used to the transition,” heavily pregnant, she lifts her arm from stroking her cumbersome belly and sips her tea. “I understand having a side fling or love affair is stereotypically more French, but Switzerland is close enough,” I laugh. So, that’s how I really started to accept the transition. This Type-A personality had a plan, a plan to date a city, an image of candlelit dinners and strolls by the Rhine. I don’t have the luxury of an ‘Eat, Pray, Love’ journey, my marriage is too solid and I have two little ones in tow, so here I am taking this on as an exciting affair. I first visited Switzerland in the winter of 2018, I was on holiday and I vividly remember the train trip from Zurich airport to Basel. I had never seen snow so beautiful, the crystal white flakes embellished Christmas trees and dripped off pine cones. It was picturesque. When I finally arrived in the city I remember thinking that it had all the European charm you see in the postcards and so much character. I fell in love with the architecture, the efficiency of the public transport system and the water; drinking fountains around the city constantly sprout fresh spring water. My daughter became a fan of Swiss cheese fondue, me, not so much. I did however love the Octopus salad at an Asian inspired restaurant chain called Nooch, go figure! My beach loving children were not impressed with the cold, but a ski trip, hot chocolate and chestnuts helped the entire family climatize. After a week in Basel, I was both sad and happy to go home. The city left a lasting impression. I was happy to return to warm Sydney, to return to work and see my family but in my mind, Basel became my happy place. 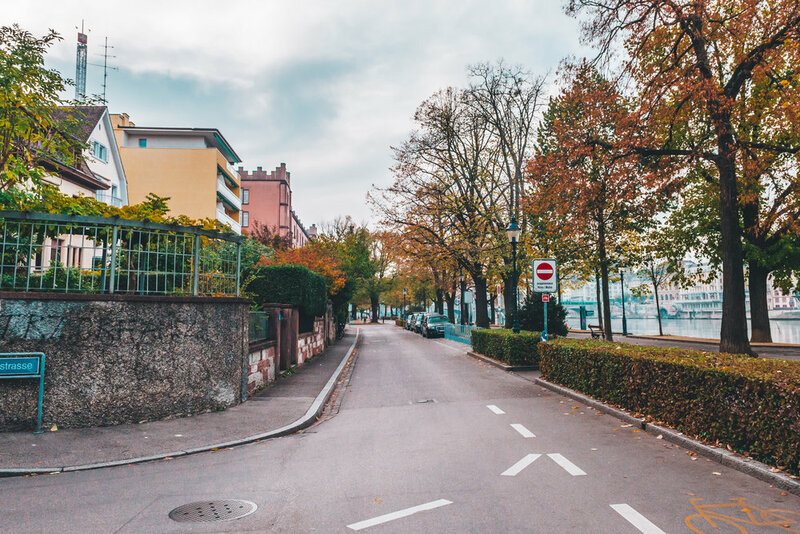 Memories of strolling along the Rhine, making snow angels (I can’t ski…yet) and daytrips to France and Germany meant I saw Basel as a pleasant place, both quaint and nostalgic. 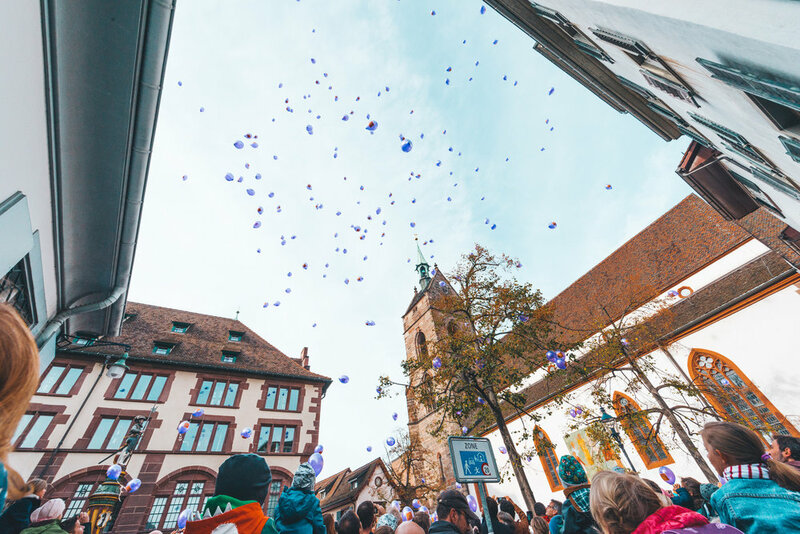 We arrived in Basel on May 17 and so here I am starting a relationship with a city and sharing it with you, because as every avid literature lover knows, a place is a character too. I will share the good, the bad and the awkward. It will be raw, honest and a bit romantic, ‘cause hey! I’m in Europe now. Apart from a few sharp dagger-like death stares aimed at me for eating pizza with my hands and one night of deep sobbing on a pile of towels in the laundry, I have enjoyed the move so far.